The syndicates are small, themed discussion groups that produce recommendations to help improve journalism education worldwide. They encourage all WJEC conference-goers to join themed discussion groups of their choosing. Each syndicate team is asked to analyze its topic and make recommendations for its colleagues across the globe. The discussion groups focus on some of the most urgent, important issues in journalism education today. Rapporteurs summarize the findings, and WJEC publishes them online and elsewhere when possible. Each syndicate team is matched with an expert scholar, chair and rapporteur. Before on-site discussions begin, syndicate members are introduced to one another online and receive their expert scholar’s background paper to bring them up to speed on their topic. During on-site discussions, issues are further discussed and concluded with specific recommendations. Each discussion is guided by a specific question, which helps it stay on task. Syndicate rapporteurs then write summary reports that are highlighted in the WJEC’s closing session and beyond. 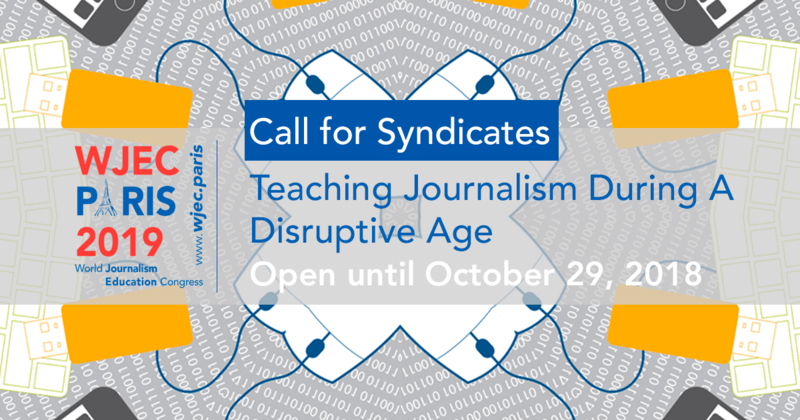 In WJEC’s first call for syndicate topics, we are looking for those that fit our Paris conference theme, “Teaching Journalism During a Disruptive Age.” Please help us ensure we do not miss the most significant journalism education topics of the day by submitting suggestions on the below link. Subjects, always from a journalism education angle, can cover a wide range of issues including sector transformations, new technologies, cross-cultural journalism, career building, etc. For a list of previous syndicate topics and their guiding questions, click on the following link: https://bit.ly/2tHymwP. Please use the following online form to submit your suggestions: https://bit.ly/2NC8cUK. This suggestion opportunity will be open until: October 29, 2018. The syndicates are a popular conference highlight, covered in your WJEC registration fees and filled on a first-come, first-served basis. Once an official list of syndicates are selected, you will be able to sign up for ONE only. Each syndicate will meet twice during the conference. You should be able to register for a syndicate once WJEC registration is opened, which will be announced in an upcoming newsletter. Sign up here to receive this notice. Download the call for Syndicates ideas and get involved in the WJEC Conference programme. NB : Submissions are open until October 1st.